This is the first in a three part series examining the current 49ers quarterbacks. Part one will focus on Brian Hoyer, part two will focus on Matt Barkley, and part three will focus on CJ Beathard. The current offseason for the 49ers, for lack of a better term, is wild. Coming off of a 2-14 season, the 49ers fired head coach Chip Kelly and general manager Trent Baalke and interviewed a dozen general manager and head coach candidates, such as Louis Riddick and Tom Cable. Owner Jed York eventually hired former NFL safety and Fox Sports NFL commentator John Lynch to be the GM and former Atlanta Falcons offensive coordinator Kyle Shanahan to be the head coach. They've signed a multitude of players, including wide receiver Pierre Garçon, linebacker Malcom Smith, and a score of other players who are familiar with Shanahan's offense and defensive coordinator Robert Saleh's defense. The theme is apparent. Shanahan wants players who fit his scheme, whom he's coached before, and in return those players can continue their NFL careers with the 49ers by teaching the young players and rookies the system. It makes sense, then, that the 49ers cut ties with Colin Kaepernick after he opted out his contract (he would've been cut if he hadn't). Filling the void in Kaepernick's absence is another player who played under Shanahan in Cleveland: Brian Hoyer. The former undrafted free agent, whose 49ers contract brought him to his fifth NFL team in nine seasons, was signed by San Francisco in addition to quarterback Matt Barkley. Both players were signal callers for the Chicago Bears last season. Brian Hoyer does not figure to be in the long-term plans of the 49ers beyond more than a season for a variety reasons: 1) He only received a two-year contract; 2) There is wild speculation that Shanahan is going to target Washington Redskins quarterback Kirk Cousins next offseason after much speculation that he would do it this offseason; 3) The 49ers also moved back into the third round compensatory pick selections to take University of Iowa quarterback CJ Beathard; 4) If Beathard doesn't show the kind of development Shanahan is looking for, the 49ers could also find themselves in a position to draft one of the top quarterback prospects next season, one of either Sam Darnold (USC), Lamar Jackson (Louisville), Josh Rosen (UCLA), or Josh Allen (Wyoming). Whatever the case is, fans should not have high expectations for Hoyer this season or beyond. It should go without saying that Hoyer is nothing more than a bridge QB to tide them over until it's time to pull the trigger on a free agent option, or in the draft or both. It's likely that he will put up some decent numbers not seen from a 49ers quarterback since Jeff Garcia's 31 touchdown/4,200 passing-yard season in 2000. That leads to the crux of the argument, though, for this article. Hoyer is a prime example of a quarterback who distorts our perception about how fans evaluate quarterback performance. Under Shanahan in Cleveland, Hoyer threw for 12 touchdowns, 13 interceptions, and 3,200 yards, and had a 55% completion percentage in 14 games. In Houston, head coach Bill O'Brien reluctantly named Hoyer his starting quarterback for week one, though neither he nor Ryan Mallett really won the job with any conviction. Hoyer was the starter in week one before being benched in week two for poor play the previous week and eventually taking over full-time as the starter in week six. The defining moment of his career is the abysmal four interception performance he had in a shutout loss to the Kansas City Chiefs in the 2015 wildcard round of the playoffs. Yet fans persist in their hype of a quarterback who on the surface has decent numbers and knows Shanahan's system. Nevertheless, a deeper dive into those numbers reveals something quite different. In 2016, Hoyer would reclaim the starting job, this time in Chicago, from Jay Cutler late in the week two Monday Night Football game and would hold that position until he was injured midway through their week seven game, relinquishing the job to current 49ers back-up quarterback (and arguably the better of the two) Matt Barkley (who will be the subject of the next film breakdown). Hoyer primarily struggles with three things: 1) decision making, 2) deep passing, and 3) short-to-intermediate accuracy. As a quarterback, he is reliant on the talent around him to make spectacular catches. In Cleveland, he did run a talent-depleted offense that had Josh Gordon, Jordan Cameron, and Miles Austin. But the talent surrounding a quarterback only tells part of the story that shows up in box scores and isn't really a good indicator of how a quarterback performs individually. Evaluating a quarterback is more than evaluating him within the offense he plays in and who he's surrounded by. Coaches do not look at stats the way fans do after a given game. Instead coaches are looking to see how well the quarterback sees the field, how well he moves from read to read in a given play and makes the correct decision, how accurate he is, and whether what he is doing mechanically needs to be fixed or adjusted week to week. Hoyer did none of that even well enough to carry what is arguably the best roster in the AFC South in Houston. So let's get into the three areas I mentioned above. Hoyer struggles with decision-making. Fortunately, Shanahan routinely finds ways to put his quarterbacks in situations where they can make the easy throws to wide open receivers. The reliance on play action will likely be a feature in Shanahan's playbook again this season. It's easy to overstate how well a quarterback plays within a given system but Shanahan's playbook is such that it would be hard for a quarterback to mess up what Shanahan gives him. In the play above, Hoyer takes the snap and rolls naked left on a boot with a high-low read of the crossing route (high) reading down to the "slam" route (low). 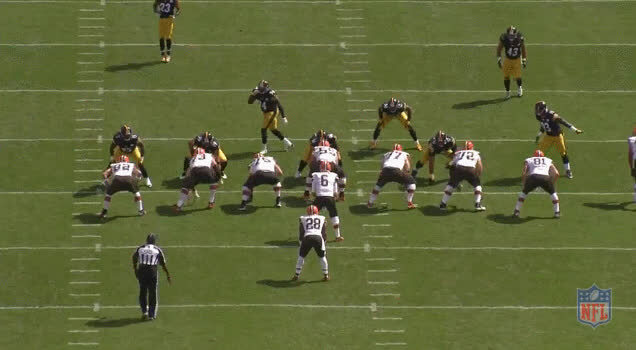 Hoyer sees that his first read is open due to the linebacker staying with the shallow out route and it's just a matter of playing pitch and catch with the target. The play is simple yet effective and goes for a nice gain. These plays in Hoyer's career seem to be the exception rather than the rule since Hoyer often times struggles with decision making. So where did Hoyer struggle in 2014? For the 2014 season, Cian Fahey started the "Interceptable Passes Project" that would eventually morph into his annual quarterback catalog. For that season, Fahey charted Hoyer with 32 interceptable passes, worst in the league that season. (An interceptable pass is a pass that is thrown at the defender and is either dropped or caught by the defender). In the above play, the Jaguars play a cover-3 "buzz" and Shanahan's play call occupies the curl/flat defenders on the three-receiver side to Hoyer's left with streak down the hash that comes open with a little patience from Hoyer. Instead, Hoyer immediately locks onto the receiver to his left and the linebacker who fills the flat for the safety playing the hook/robber over the middle. It's a defense Hoyer should have recognized before the snap with the alignment of the safety cheating up to play his "buzz" position. 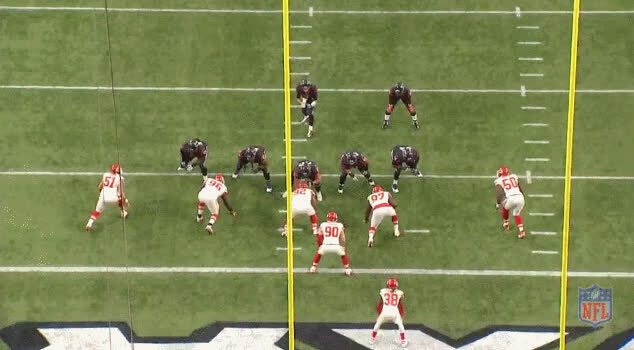 The throw sails right into the waiting hands of the linebacker in the flat who drops it. Snapshots of a few more "interceptable passes" are below. For all 32 interceptable passes, see this database. Although the stats show that Hoyer improved marginally in 2015, his season was still one that rivaled 2014. Even with top NFL talent at wide receiver (DeAndre Hopkins) and a running game that went over 1,700 yards, Hoyer still managed to play poorly enough to be benched after week one before solidifying the starting position by week six. 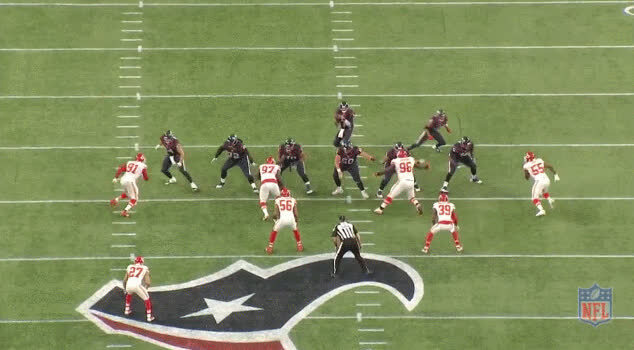 Speaking of Hopkins, no play epitomizes the Hoyer/Hopkins relationship in Houston more than the play below, during which Hoyer had a chance for 48 yards and touchdown and instead threw a pass that was worth only 26 yards. 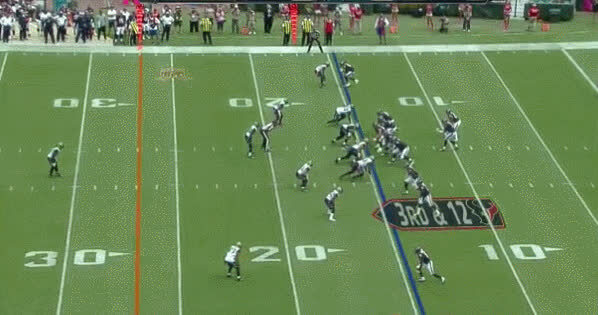 In the play above, Hopkins was working against the single coverage of the Falcons defense. He angled his route infield before stutter-stepping five yards downfield and drawing the defensive back up. At that point Hopkins easily cut his route upfield. The defensive back slipped and Hopkins was gone. As he ran, Hopkins' eyes looked back to Hoyer and was expecting the ball to fall out of the sky. He knew better than to expect his quarterback to hit him in stride with an accurate pass. The ball arrived low and behind the receiver, and forced Hopkins to twist and turn his body in order to catch it. Hoyer continued to miss Hopkins deep on several occasions throughout 2015. Hoyer was slightly better at running the Houston offense than he was at running the Browns offense, but his similarly slow process in the pocket led to inconsistency. He is a quarterback who can consistently make good decisions when making clearly-defined/half-field reads. It's when he's asked to read the defense from sideline to sideline or progress to his third or fourth option that his laborious actions stand out. Nowhere was this more apparent than in the playoff game versus the Chiefs. Hoyer would go on to complete 15 of 34 passes for 136 yards, no touchdowns, and four interceptions. In 2016, Hoyer continued to struggle reading defenses in addition to being wildly inaccurate and indecisive. Bears offensive coordinator Dowell Loggains simplified things for Hoyer last season and, as a result, the quarterback had decent production for six games. They ran quite a few of the same plays and route combinations many times, and the quarterback was often only asked to make a simple read to one side of the field to make his throws, something he does consistently well. But eventually that only gets a quarterback so far. In the play above, the Lions are in a cover-2 zone, and Hoyer should understand that the linebacker in cover-2 is going to pass off the inside tight end to the safety behind him in order to play any underneath routes. The Bears are running the "levels" passing concept with a high-to-low read on two dig routes across the middle. 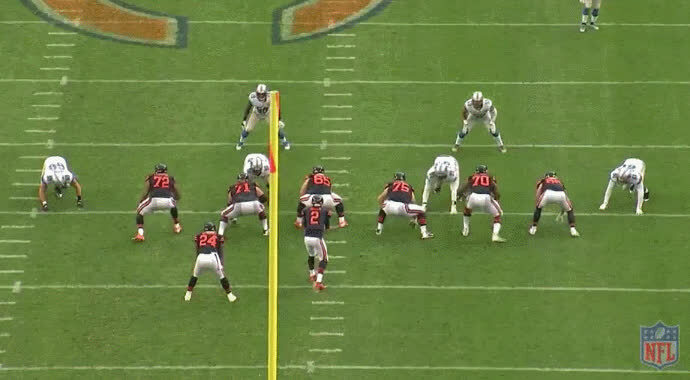 Not only does Hoyer stare down the middle linebacker in coverage, but he also reads him incorrectly. The Lions middle linebacker does in fact pass the tight end off to the safety, and he's able to get his fingertips on the poorly thrown pass to wide receiver Kevin White. Had he not hesitated slightly, the linebacker may have had an opportunity to get a full hand or two on the pass, but instead it goes down as only an incomplete pass on what was a potentially dangerous throw. With the Lions again in cover-2 (really a Tampa 2 shell), Hoyer is simply reading the cornerback on the "slant-flat" combo. In a traditional cover-2, the corner will generally play the flat. However, in a Tampa 2, the corner will sink and defend against the "nine" route with a receiver who runs up field. 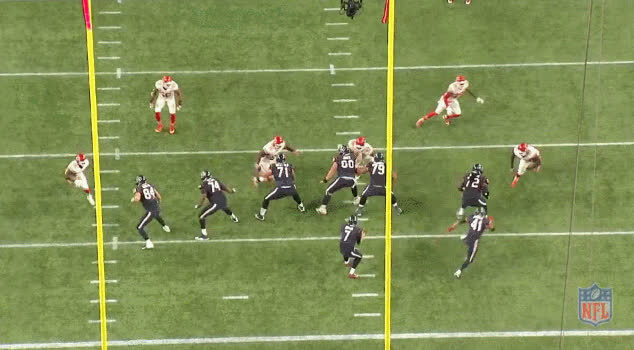 Hoyer sees the corner drop but instead of waiting to throw the slant from a clean pocket, he turns his eyes to Paulsen, who's covered in the flat by the linebacker. The pass falls incomplete out of bounds. 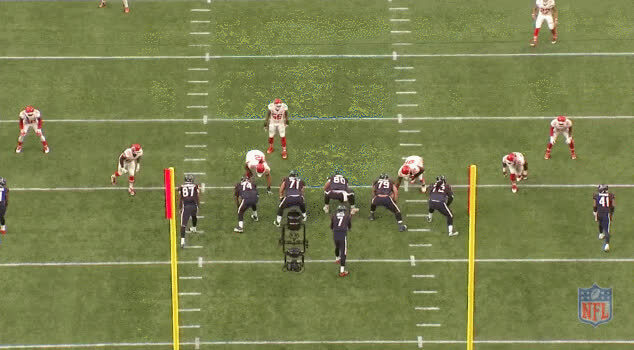 Even on some completions, Hoyer still left yards on the field as he made the wrong read. The stat sheet shows a completion and to the fan watching, it just looks like a case of a quarterback taking what the defense gave him. Throw. Catch. Completion. Simple, right? Not really. The Lions are again in cover-2 and this time Hoyer is reading the cornerback on the "curl-flat" concept. If the corner plays the flat route, the curl should be open at the first down marker. But if the corner sinks into the curl route, the flat should be open. 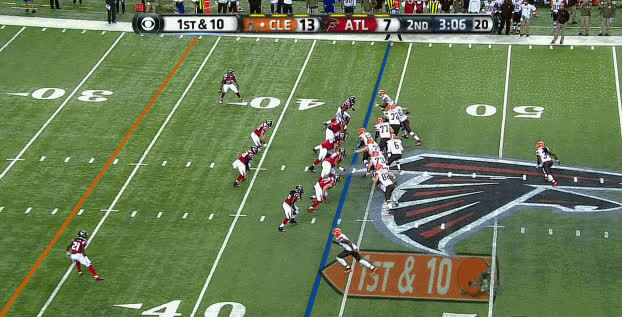 The defensive back does in fact play his flat responsibility yet Hoyer still throws to Paulsen in the flat. 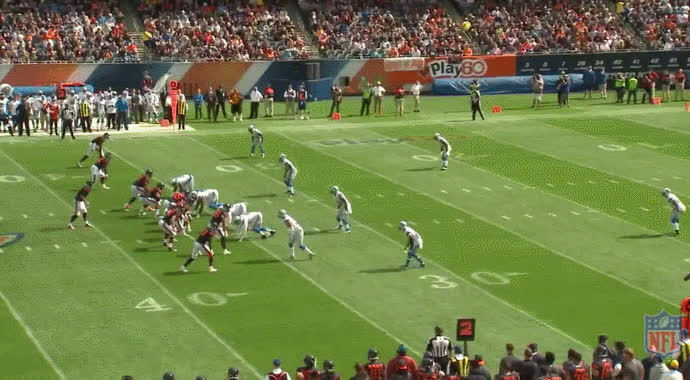 The Lions defensive back gives the initial move toward White on the curl route and this prompts Hoyer's early throw instead of letting the play develop. Defensive back Darius Slay makes the tackle for a three yard gain on second down. It's not likely Hoyer takes the next step as a quarterback and no one should really expect him to. He'll put up some nice numbers, his mistakes will be overlooked, and we'll be right back where we started with him. But maybe his mistakes should be overlooked. We know that he's likely a bridge as the 49ers keep rebuilding into the next couple of years. And he's proven that despite the mistakes and flaws, he is a smart, capable quarterback who can teach the offense to the younger guys and would actually be a suitable back-up who can come off the bench when needed. For now, he is who he is and fans shouldn't really expect any more or less of him at this point in his career.